Infiniti revealed its Q30 Active Compact and European-exclusive Q30 City Black edition earlier this week at the International Frankfurt Motor Show. The hatchback represents Infiniti's first global entry into the fast-growing premium compact segment. It remains true to the original design concept that was debuted by the luxury Japanese brand in 2013 and boast an appearance that demands attention due to it's unconventional features. Roland Krueger, President of Infiniti, commented: "Q30 makes a daring visual statement through its sculpted, concept-car exterior, unconventional stance and asymmetric cabin design. The car has been engineered to exacting standards to deliver a driving experience that is unmistakably Infiniti. Q30 will accelerate the company's strategy to become a leading global manufacturer of premium cars." 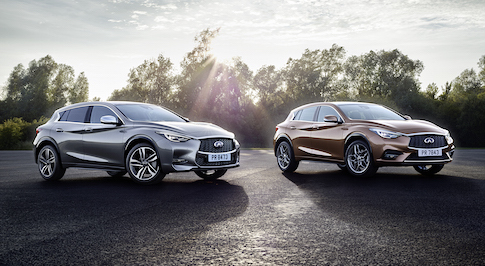 The new Q30 has been launched at an opportune time for Infiniti, who sold a record 136,700 new vehicles worldwide during the first eight months of 2015, representing an increase of 14% compared to the same period in 2014. As a brand, Infiniti is aiming to strengthen its presence in key sales regions across the world.